I entered the avian world when I bought my sweet Ze’ Birdy at age 11 weeks. Yes, it was an impulse of sorts, even though it took me several weeks to convince my husband. No, I didn’t know “squat” about owning a bird, especially a U2. My learning curve was steep, and I learned much from this bird. I treated her much as I treated my dogs. I always considered her a dog with feathers. I took her places, I played with her, and I tried to train her as best I could. Truth be told though, she taught me. Yes, I’ve been bitten, listened to screams and experienced those typical 2 behaviors. I’m convinced that in every instance I was at fault when bitten, and I was not providing what she needed when she kept up with the screaming. Both of those behaviors have diminished, yet I know every day is a challenge. And yes…..I still receive bites when I am not paying attention and listening to her needs. I was smitten by the cuddly, sweet young U2. As I met others who had experiences with U2s, I began to hear horror stories. At one point I was so scared I seriously thought I should give her up. I didn’t though, and I have been rewarded with an awesome companion. 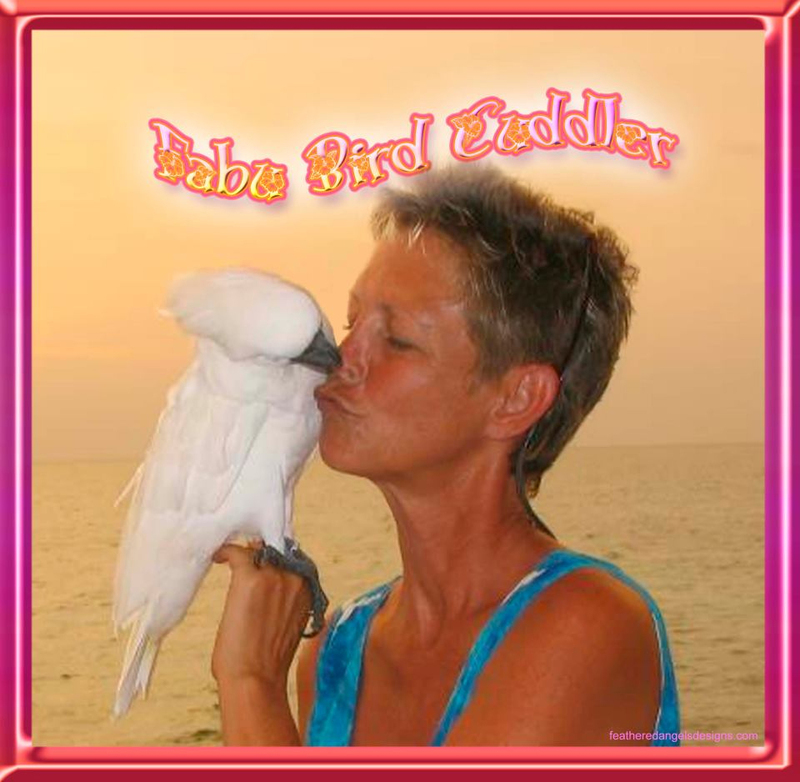 As I became involved in the Avian world, I became more aware of what a commitment I had made. I also saw how lightly many took their commitments to their companions. I wanted to help, I wanted to do something, but I just didn’t know how. As a very dear friend told me, I was just looking to find my place in this crazy Avian life. I believe I am now (11 years later) seeing what I want and need to do to be a part of this community. I must spread the word, I must help to raise funds, and I must support those who know more than I ever will in carrying out this mission. I have seen, firsthand two totally different perspectives for rescue and care. I have my opinions as to the right one, but that is just that….my opinion, and as long as birds are cared for, especially until we can end the abuse and neglect, I will not condemn any of them. I am amazed every day by the number of horror stories that come to light concerning these creatures. I also believe that we should have never tried to domesticate them. In so many ways they are smarter than we are. Humans are typically just not committed enough to provide the life that a parrot needs. Just look at how society treats children, marriage, relationships, the elderly and disabled. Why would we think we could do better with these intellectual giants we have tried to turn into “pets”? We must UNITE, and stop the madness that is happening as there truly is strength in numbers. We must educate, educate, educate until we are blue in the face. We must make the world aware of what is going on. Every time someone see’s me with Ze’, I make sure I tell them what is going on with these birds. I encourage them to support rescues. I encourage them to read. I discourage them from owning a bird unless they do their homework and examine their motives. Why is it the first question out of their mouth is usually “Can she talk”? Why is that so important? Is that what people think owning a bird is about? We must support those who have so selflessly taken on the battle to do what is right for these parrots. We need to come together, pull together and help each other. Rescues need a way to communicate with each other. Statistics need to be pulled together to support our first-hand knowledge that countless parrots are being abused, neglected, abandoned and often euthanized. Our voice will not be taken seriously until we do just that. Yes, I am often silly and goofy, but I am deadly serious when it comes to the welfare of our parrots. I have dogs and cats, and I take their welfare just as seriously, but in all honesty, the three species can not be treated the same. I thank everyone in this group for their passion. Now if we can combine the passion for what is best for Parrots, we will achieve success. This issue is not religion, not politics, and not a light-hearted past time. Thank you for giving me this chance to voice my opinion. I am in this for the long haul, and will continue to support those in a position to make better homes and lives for these truly incredible life-partners……our Parrots.